On April 20th, 2018 Operation Vet Fit conducted a first-of-its-kind marijuana research study to investigate if marijuana demonstrates measurable medicinal values in outcomes on depression, anxiety and pain amongst US Military veterans. Marijuana is still federally classified as a Schedule 1 drug based on its designation of having, "no medical use and a high potential for abuse". Further, that marijuana, under Schedule 1 classification, is considered as dangerous as: "heroin, lysergic acid diethylamide (LSD), methylenedioxymethamphetamine (ecstasy), methaqualone, and peyote" (DEA). Moreover, marijuana's classification also identifies it as more dangerous than: "Vicodin, cocaine, methamphetamine, methadone, hydromorphone (Dilaudid), meperidine (Demerol), oxycodone (OxyContin), fentanyl, Dexedrine, Adderall, Ritalin, Tylenol with codeine, ketamine, anabolic steroids, testosterone, Xanax, Soma, Darvon, Darvocet, Valium, Ativan, Talwin, Ambien, and Tramadol" (DEA). Marijuana's schedule 1 classification also makes medical research elusive, if not impossible due to institutional fears of shut-down, loss of licensure, defunding and criminal prosecution. Such concerns have created barriers to research making data on the plant's medical impact hard to attain from credible agencies such as the Veterans Affairs (VA) and United States college and university research teams. This lack of available and credible data have stifled lawmakers' attempts to reclassify the plant as medicine rather than a dangerous and addictive drug. Currently, twenty veterans commit suicide daily. And while the VA's current "best practices" for pain management and PTSD include prescribing a cocktail of medications, including dangerous opioids that are highly addictive, veterans living in states with medical marijuana laws are coming forward, sharing their stories of freeing themselves from opioids by choosing medical marijuana as the alternative. The timing of this study comes as the President of the United States has declared the opioid overdose and addiction epidemic a national emergency. 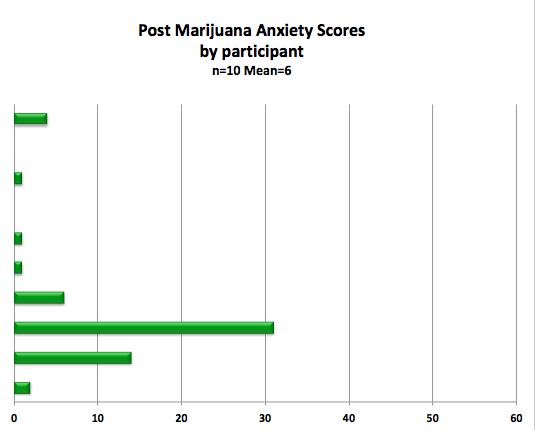 The goal of our agency's research herein is to measure marijuana's impact on pain, anxiety and depression. To do so we will be utilizing our combat veteran population living in states where they are legally able to attain medical marijuana. Should this study infer a medical benefit, further research amongst our more highly funded and independent institutions can and should follow. Participants - Thirty-two veteran members of the United States Armed Forces were recruited via social media. Veteran status was verified via confidential submission of participants' DD214 (Certificate of Release or Discharge from Active Duty) with names and Social Security numbers omitted. Of the thirty-two original registrants, ten did not submit a copy of their DD214 making them ineligible to participate in this study. As a result, twenty-two verified US Armed Forces Veterans were provided with direct website links to complete pre and post measures (BDI, BAI, Pain Scale), just prior to and following their marijuana utilization. Of those twenty-two provided the web links to the anonymous pre and post surveys, only eleven completed the pre measures. Of them, ten completed the post measures. The identities of those completing the measures remained annonymous throughout and following the study conclusion. Only those who provided a copy of their DD214 were granted website links and password access to the measures for completion. Additionally, we collected data on each participant's current VA disability rating, as well as their VA disability rating for PTSD and total number of years they have been utilizing marijuana to treat their symptoms. 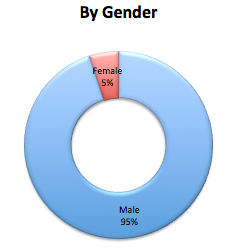 Population Demographics - Of the 22 initial participants, 21 were male. 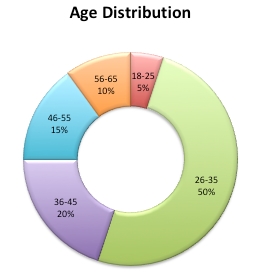 Average age was 38 with a (SD=10.58). Ages ranged from 25-62 years. Nine of the participants were engaged by or engaged the enemy in combat (Combat Action). Of those nine, average combat theatre exposure was 14 months (SD= 10.07) with 33 months in theatre being the lengthiest observed participant. Eleven participants served in a combat theatre but did not engage in combat action. Average population deployment time total was 13 months (SD=15.11). Five subjects never deployed. 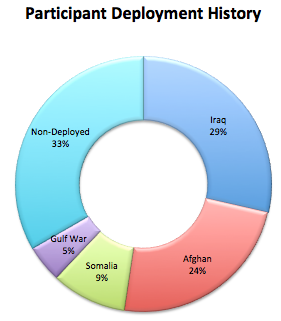 Of those who did deploy, average deployment time total was 17 months (SD=15.35). The subject with the lengthiest deployment history served 59 months overseas. Average rank of all participants was E4 (SD=1.5), with only enlisted veterans making up the total population. All but one of the participants had a VA disability rating. 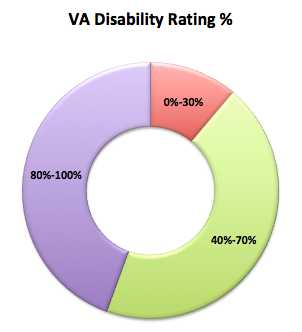 Average VA disability rating of the population group was 70% (SD 30.01) with 73% having a VA diagnosis and rating for PTSD. No officers participated in this study. Six of the participants served in Iraq, five served in Afghanistan, two in Somalia, and one in the Gulf War. Post Traumatic Stress Disorder (PTSD) - Rating was based on veterans' VA determination of severity as provided by the participant. VA ratings for PTSD require exhaustive evaluations using both objective and subjective measures. The reliability of a VA rating is far superior than requiring the the veteran to complete a separate individual subjective questionnaire. For these reasons we are avoiding the use of additional PTSD measures. Depression - Was measured using the Beck's Depression Inventory (BDI) taken prior to and following utilization of medical marijuana. 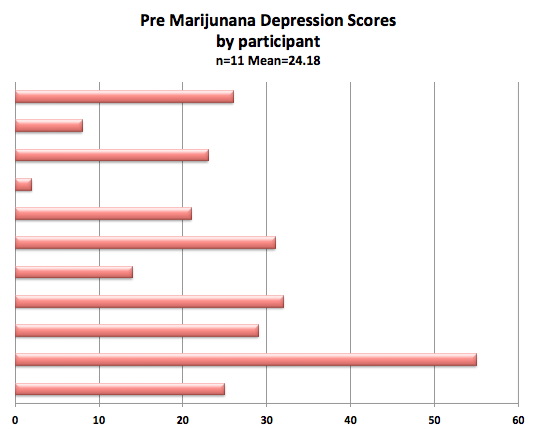 Pre marijuana utilization scores for depression in the population sample demonstrated a mean of 24.18 n=11; (SD=13.98) placing the population sample, prior to using marijuana, within the second highest depression category of "Moderate Depression"(Beck et al., 1988). The Beck Depression Inventory (BDI) is a 21-item, self-report rating inventory that measures characteristic attitudes and symptoms of depression (Beck, et al., 1961). Internal consistency for the BDI ranges from .73 to .92 with a mean of .86. (Beck, Steer, & Garbin, 1988). The BDI demonstrates high internal consistency, with alpha coefficients of .86 and .81 for psychiatric and non-psychiatric populations respectively (Beck et al., 1988). 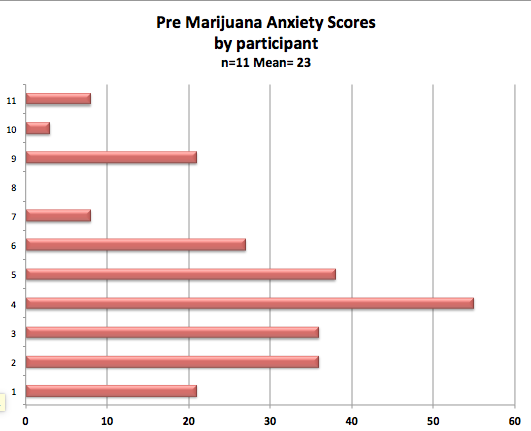 Anxiety- Was measured using the Beck's Anxiety Inventory (BAI) taken prior to and following ingestion of medical marijuana. Pre marijuana utilization scores for anxiety in the population sample demonstrated a mean of 23 (n=11); (SD=17.29) placing the population sample, prior to using marijuana, within the category of "Moderate Anxiety"(Beck Epstein, Brown & Steer 1988). The Beck Anxiety Inventory (BAI), created by Aaron T. Beck and other colleagues, is a 21-question multiple-choice self-report inventory that is used for measuring the severity of anxiety in children and adults. The questions used in this measure ask about common symptoms of anxiety that the subject has had during the past week. Several studies have found the Beck Anxiety Inventory to be an accurate measure of anxiety symptoms in children and adults (Leyfer, Ruberg, & Woodruff-Borden, 2006 ). The Beck Anxiety Inventory is a well accepted self-report measure of anxiety in adults and adolescents for use in both clinical and research settings (Groth-Marnat, 1990). The BAI is psychometrically sound. Internal consistency (Cronbach’s alpha) ranges from .92 to .94 for adults and test-retest (one week interval) reliability is .75 (Beck Epstein, Brown & Steer 1988). Pain - Was measured utilizing the Universal Pain Assessment Tool below taken prior to and following ingestion of medical marijuana. 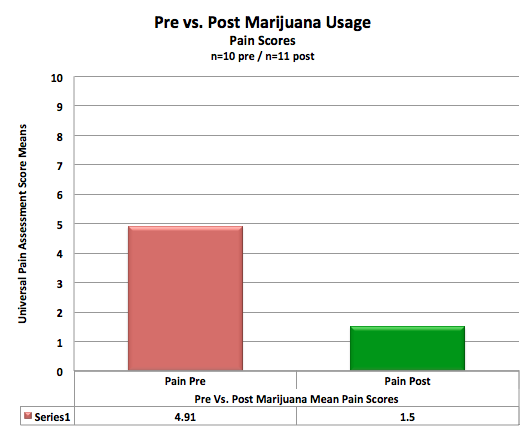 Pre marijuana utilization scores for pain in the population sample demonstrated a mean of 4.91 n=11; (SD=2.23) placing the population sample, prior to using marijuana, within the "Moderate Pain" category. The Universal Pain Assessment Tool (UPAT) combines the advantages of four types of pain assessment instruments – Visual Analogue Scale, adjective scales, Numerical Rating Scales (NRS) and Faces Scales. The Universal Pain Assessment Tool aims to describe completely the individual's pain experience. The combination of NRS, verbal description, association between pain and facial expression and individual threshold of pain makes this instrument usable in all age groups (Hockenberry, Wilson, Wilkenstein & Wong, 2005; Hesselgard, Larsson, Romner, Strömblad &, Reinstrup, 2007; Edelen & Saliba, 2010). Marijuana utilization amongst the population sample in this study demonstrated significant reductions in pain, anxiety and depression for 100% of the participants. 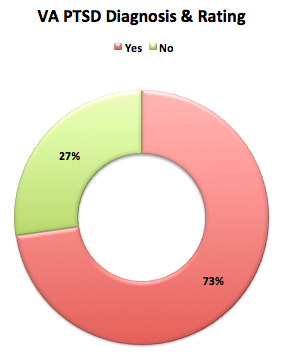 Graphical results of pre and post marijuana utilization amongst our population sample have been provided below. The results contained herein, while promising for supporters of medical marijuana, must also be weighed within the constraints of the population sample size. That said, future research involving larger population samples can now be obtained by utilizing our study methods to acquire data from all citizens that currently rely on medical marijuana in states where it is legal to obtain. The results contained in this anonymous study are a call to action to all institutions fearful of conducting this type of research within the confines and restrictions of their institutions. Such fear has ultimately retarded research. Such research dysfunction due to sociopolitical obstructions continue to disproportionally impact lower income communities. Moreover, prolonging the suffering being incurred by trusting patients of medical doctors that are routinely prescribing a myriad of medications to treat pain, depression and anxiety. Such medications that are currently legal to prescribe have resulted in an opiod and heroine epidemic that might argueably be halted via legal access and utilization of marijuana to treat similar, as well as a growing number of other symptoms. This study has been conducted on the heels of United States President, Donald Trump declaring an opioid crisis in America. Further, the President has implored those of us in the fields of medicine, mental health, research and social work to submit comments to the World Health Organization specific to marijuana's classification as a Schedule 1 drug. Such steps will eventually result in political debates within the halls of the US Congress which will inevitably be delayed, tabled and put off at the cost of American lives, families and strain within our social service and prison systems. Such a realization should weigh heavily on the consciousness of our law makers. Their (US Congressional) delay on this matter is resulting in more deaths per year due to opioid overdoses than all of America's war dead since 1965. To reiterate, according to the CDC, Opioids were involved in 42,249 deaths in 2016 alone. To put this into truer perspective, the number of Opioid related deaths in America in 2016 is nearly six times greater than all of Americas war dead since September 11th, 2001 and nearly equal to all of our war dead from 1965 to present. Meanwhile, research continues to compile studies such as this whereby marijuana appears to not only have medical value, but may very well be the plant that ends the opioid crisis. Recognizing that much more research is still to be done on this plant, it appears rather obvious that Marijuana is currently amongst the wrong classification of drugs and deserves to be rescheduled and researched in a more stable and clinical environment. Something that simply can not occur as it stands as a Schedule 1 drug. When the reclassification does occur, because it will, research will need to look at this plant in all of its many facets specific to genetic variances, Strains, concentrations, and ratios of each. Primarily, medical marijuana comes in an Indica, Sativa or Hybrid blend of both strains. Future studies should also collect on these variables to ascertain outcomes for each to assist the medical community in addressing the question of dosage, timing and respective impact on symptoms as well as ratios of various plant components such as CBD:THC. American Forces Press Service. (2013) United States Department of Defense. 18 January 2013. Archived from the original (PDF) on 16 January 2013. Retrieved 19 January 2013. Beck A.T., Epstein N, Brown G, Steer RA (1988). "An inventory for measuring clinical anxiety: Psychometric properties". Journal of Consulting and Clinical Psychology. 56: 893–897. doi:10.1037/0022-006x.56.6.893. Beck, A.T., Ward, C. H., Mendelson, M., Mock, J., & Erbaugh, J. (1961). An inventory for measuring depression. Archives of General Psychiatry, 4, 561-571. Beck, A.T., Steer, R.A., & Garbin, M.G. (1988). Psychometric properties of the Beck Depression Inventory: Twenty-five years of evaluation. Clinical Psychology Review, 8(1), 77-100. Edelen MO, Saliba D. (2010). Correspondence of verbal descriptor and numeric rating scales for pain intensity: an item response theory calibration.J Gerontol A Biol Sci Med Sci. 2010;65(7):778-85. Groth-Marnat G. (1990). The handbook of psychological assessment (2nd ed.). New York: John Wiley & Sons. Hesselgard K, Larsson S, Romner B, Strömblad LG, Reinstrup P. (2007). Validity and reliability of the Behavioural Observational Pain Scale for postoperative pain measurement in children 1-7 years of age.Pediatr Crit Care Med. 2007;8(2):102-8. Hockenberry MJ, Wilson D, Wilkenstein ML. Wong (2005). Essentials of Pediatric Nursing.7th ed.St Louis: Mosby. Hojat, M., Shapurian, R., Mehrya, A.H., (1986). Psychometric properties of a Persian version of the short form of the Beck Depression Inventory for Iranian college students, Psychological Reports, 59(1), 331-338. Osman, A; Hoffman, J; Barrios, FX; Kopper, BA; Breitenstein, JL; Hahn, SK (2002). "Factor structure, reliability, and validity of the Beck Anxiety Inventory in adolescent psychiatric inpatients". Journal of clinical psychology. 58(4): 443–56. doi:10.1002/jclp.1154. PMID 11920696. Steer, R. A., Rissmiller, D. J.& Beck, A.T., (2000). Use of the Beck Depression Inventory with depressed geriatric patients. Behaviour Research and Therapy, 38(3), 311-318.